A few years from now, looking back, men will wonder why they hesitated so long in taking the obvious and most natural action: sharing the resources of the world. Experiencing warmly the new stability, the lack of tension, the ease of international co-operation, men will wonder how they could have been so blind to the self-evident, so wilful and destructive to their own best interests for so long. Humanity stands now at the threshold of an entirely new experience in which every global decision and act will be seen to be for the better, as nourishing and sanctifying their lives, and strengthening the bonds of Brotherhood which, up till then, they had ignored and all but forgotten. Gladly, men will now work together for the Common Good, the hatred and distrust of the past put firmly behind them. Thus will a new kinship emerge as Goodwill and Respect, like vitalizing yeast, saturate their awakened lives. Thus, too, in ever strengthening measure, will love and joy embrace and lighten the hearts of men and women everywhere. What subtle alchemy can it be that will work this magical transformation in the lives of men? Not alchemy but the divinity which dwells in the hearts of men themselves, evoked and brought forth by the wonder of Maitreya’s Love. “Sharing,” He has said, “is divine; the first step into sharing is the first step into your divinity.” In man himself lies the full measure of that divinity. Sharing will demonstrate that man is a potential God and is equipped to express the creative Will of his Source. Slowly but surely, that creative Purpose will manifest through men and so direct their actions and decisions. The old lawlessness will wither away and disappear like a faded memory of a distant, childish past. So will it be. Above all, We recognize that this creative outflow, unprecedented in scope in human history, is the inevitable result of the great inner change through which humanity is passing: learning to live within the Laws of Life. When men see and understand this consciously, as a fact of life, they will take, gladly, the steps which lead directly to Peace and Justice, Freedom and Right Relationship. That first step is called Sharing. With Maitreya, the Lord of Love, and His group of Masters to help and guide, how can men fail to see that Sharing and Right Relationship are the same, have the same impulse: to demonstrate the urge to Unity which underlies our apparent separation, and so reveal the true nature of men as Gods. Q. What is the best way to ‘see’ Maitreya? A. Make yourself useful to Him by telling the world (or your small bit of it) that He is here and ready to show humanity the way to end its problems: principally, as a first step, by accepting the principle of sharing. Q. What should Tibetan exiles do – protest, continue to draw attention to the plight of their country or wait for China to recognize the right of Tibet to be independent and free? A. Protest and continue to draw attention to the plight of their country. Q. Should the Beijing Olympics be boycotted by (1) athletes? (2) Heads of state? (3) The world’s media who would normally cover the Olympic Games? A. (1) No. (2) No. (3) No. Excluding China in this way would not change China’s views. It would only isolate China and exacerbate the present situation. Q. Would contact and interchange with China, at the time of the Olympic Games, be preferable to boycotting as a means to normalize international relations? Q. Would you please be so kind as to ask your Master if there was any help by the Masters or Maitreya during the Tibetan uprising between 10 March and 31 March 2008 in Tibet and three more provinces in China, to reduce more and longer violence (by Chinese forces)? Q. I grew up middle class in America and though I now live below the poverty line, I am used to the materiality of this country. Benjamin Creme frequently says that the coming changes for us in the developed world will be, in his words, “painful”. In Maitreya’s Messages He says: “My Coming will mean the end of the old order of things.... This will cause many to grieve but so it must be.” [Message No. 4] These words make me uneasy. My question is: Will Maitreya help us deal with our grief? Will He hold our hand through this process? I am afraid of the grief to come. Please be kind in your response. A. It is obvious, is it not, that if we are living as do millionaires and billionaires, then the sacrifices we would have to make to simplify our demands on the planet would be more painful than for those already living more modestly. If you, as you say, are now living below the poverty line – even for America – then you will not feel simplification a problem. It is the ‘waste’ mentality which, I think, will be most difficult for the developed nations to give up. Q. (1) What is the distinction between Maitreya and the Master Jesus referred to in the ‘Letters to the Editor’? (2) Why is it that in those letters it is always confirmed that one or both of those beings is the source of a spiritual/metaphysical manifestation? It just seems too biased to be credible in nearly every letter! (3) For what it’s worth, I enjoy getting the online version and reading/reflecting on the issues in your publication. It’s a source of guidance and offers insight into the world issues we confront daily. Lastly, just wanted you to know how much I appreciate your artwork which graces the covers of your books. As an abstract artist, your works are especially engaging to me. Look forward to your reply. A. (1) Maitreya is the personal name of the Head and Leader of the Spiritual Hierarchy: “The Teacher alike of Angels and of men.” The Master Jesus is one of His disciples, a very advanced Master. They seem to work together much of the time. In Palestine 2,000 years ago, Maitreya, Who embodies the Christ Principle, manifested Himself through Jesus for the last three years of Jesus’ life. Maitreya is the Christ, Jesus was the vehicle used in full consciousness. (2) Yes, these two Great Ones work together nearly all the time. Maitreya having overshadowed Jesus in Palestine, there is obviously a very special bond between Them. We only publish letters which can be confirmed as authentic appearances of the Masters. We do get many which cannot be so confirmed. (3) I am glad you find our information interesting and enlightening. I am also glad that you like my paintings. Thank you. Q. What is your opinion of plans in the UK to mix human and animal genetic material for research purposes? A. It has already been done illegally, behind closed doors, in laboratories in several countries. If handled with great care it can be useful, but in the wrong hands the procedure is fraught with danger. On 24 March 2008 we participated in the peace march from Delft Station to the centre of The Hague. The atmosphere was pleasant, in spite of the very cold weather. A man full of wrinkles and no teeth, in a black corduroy suit with a red scarf, was busy the whole time talking to and encouraging bystanders to get involved in the demonstration, and he kept agreeing enthusiastically with the speakers. He seemed a little drunk and said that he was a ‘Hagenees’ (humorous term for an inhabitant of the Hague) and later that he was a ‘Rotterdammer’ (inhabitant of Rotterdam). Was he a Master? From the Transmission Meditation group in Nijmegen, the Netherlands. (1) On 15 March 2008 we were at the Dam Square in Amsterdam for a peace demonstration. Three of us were holding up a banner saying: “Only sharing and justice will bring peace”, in Dutch and English. A small man approached us. He wore a black, high hat and a stripey yellow and blue scarf. He had a bloodshot eye and a hearing aid in his right ear. He looked lively and open. He pointed at the banner and said: “There is always a Messiah in the world.” To that we said with one voice: “Yes, Maitreya”. Then he said: “It is God.” He did not confirm that it was Maitreya, but did not deny it either. It seemed as if we were slightly challenged. When someone mentioned Maitreya Buddha he started to talk about Buddhists, that they would not even kill an ant, or a spider. He asked if we were afraid of spiders? He used to be afraid of them, but not any more. He had even dared to hold a huge spider in his hands. He was serious and funny at the same time and it felt like an invitation to pass over your own fears. Then he talked for a while with a few others, and told them that in Israel the Messiah is appearing to very many people, and Joshua too. After that he was gone. Was he Maitreya or the Master Jesus? I would also like to ask you about a photographer: a tall, slender man with thin hair and a friendly look, who showed up on a bicycle and continued to circle around us and take pictures of our banner, from all angles. When a homeless person came by and started to grumble in English about the word ‘Justice’ on the banner, the photographer immediately came to reassure us that this is just the way people from Amsterdam may react. He keeps coming to my mind. Was he someone special too? M. B.-de L., the Netherlands. On 25 April 2008 I gave a lecture in Annecy, France, about the patterns of light phenomenon. The lecture was split into three parts: the patterns of light; the link with UFOs; and the link with the Masters of Wisdom and Maitreya. After an hour, while I was speaking about the Masters of Wisdom, a man came into the lecture room. He was distinguished, with nice white hair and a red pullover. He came and sat in the front row and stayed until the end of the lecture, without saying anything. As soon as I saw him, I thought he was Maitreya. His general attitude was very quiet and his walk reminded me of another (confirmed) meeting I had had with Maitreya at a book fair in 2006. Can you confirm if this man was Maitreya? J. R., Le Locle, Switzerland. It was close to midnight on an autumn night, a few months ago  in Barcelona. I was walking towards my car to go home after Transmission Meditation. As I went to cross a street at a zebra crossing, a motorbike suddenly appeared on my right and I had to stop. It was an old-style collector’s type of motorbike. There were two old men dressed in old-style biker’s outfits with helmets, riding it. The white hair of the driver came out from the sides and bottom of the helmet and somehow he reminded me of Benjamin Creme. They were animatedly talking with each other, totally at ease and comfortable. Amazingly, the motorbike was moving, but at the same time it seemed to take ages till it finished passing the zebra crossing and turned left at the corner, as if they were moving outside time. I walked another block to get my car and was still wondering about these two old bikers. It was a bit weird to find anyone there at that time of the night, unless they were lost. But they didn’t seem to be lost. Just driving around and enjoying life, not seeming to be going anywhere specifically. I started driving home and was at a roundabout where I take the road to a nearby town where I live, waiting for the traffic light to turn green. Suddenly I froze. From a small street entering the roundabout the motorbike with the two old men appeared again. I could not believe my eyes. I couldn’t figure out how they had got to that street from the first place I met them, as it is almost impossible to do it. I continued on my way home, still wondering about the whole situation. Were the two old bikers just ordinary people or perhaps someone special? In January 2008 I was due to receive back a granite table that was repaired after an accident. That day the lift was broken, and as I live on the sixth floor, I tried to rearrange the delivery, but it was too late, as it was on its way. When they arrived, I explained the situation and suggested they come another day. They made a phone call and told me that they had to do it that day and that a crane with a lift was going to come, if my neighbours would accept to have it passed through their balcony as my flat is at the back of the building. My neighbour agreed and all was arranged. They positioned the crane and started lifting the table, with much fuss in the street because of it. I was very nervous, as I was worried that an accident could happen. But everything went well and we arrived at the front door of my flat. The door was closed. My two sons, who had been inside before, had gone out, leaving me with a closed door, without keys or a mobile phone to call them. Then I became very worried. When I told the two workers who were waiting that there was only my cat, Chinin, at home, one of them said: “Mom, you should have taught your cat to open the door.” I remembered that when my cat was young, he used to find a way to open the door to go out. Instinctively, through the door, I tried to speak with my cat, telling him: “Chinin, open the door, come on, please.” The two men looked at each other, probably thinking I was a bit mad, but suddenly, in a fraction of a second, the door opened and Chinin came out. One of the men, the one who had joked about teaching the cat to open the door, babbled: “I thought I had already seen it all.” They assembled the table as quickly as they could, and went, without saying a word, as if they were in a hurry. Did Chinin, the cat, indeed open the door? In August 2003-2004, between 8 and 9pm, a friend of mine who has a guesthouse in West Clare, Ireland, was standing outside with one of her guests. He saw a strange circular object lit up underneath, coming very close to her chimney. It swooped down very close and took off suddenly again. They were both startled and decided to keep it a secret, as they did not want to attract press attention. What was the object and where did it come from? Did it have a purpose or was it just to say hello? J. C., Annagh, County Clare, Ireland. An Australian girl has become the first transplant patient to change blood group and take on the immune system of her organ donor, according to a report in The New England Journal of Medicine. Demi-Lee Brennan, aged 15, received a donor liver when she was nine years old because her own liver had failed. However, she became ill while being given drugs to avoid her body’s rejection of the transplanted liver. Brennan’s blood then inexplicably changed from her own ‘O negative’ blood group to ‘O positive’, the blood group of her donor. Her new liver’s blood stem cells entered her body’s bone marrow to take over her entire immune system. The result is that Brennan no longer needs anti-rejection drugs. On 4 April 2008 Yorkshire newspaper Wakefield Express, in the UK, featured a report titled “Face of Jesus?” It described how five-year old William Glancy painted a mask for an Easter art project at the Wakefield Independent school’s holiday club. After splashing paint over a white mask, and allowing it to dry, William was surprised to discover that it revealed a face. When his mother arrived at the club to collect him he was showing everyone the mask saying: “Look, look, it’s Jesus!” This happened the day before Good Friday and has amazed all those who have seen it. 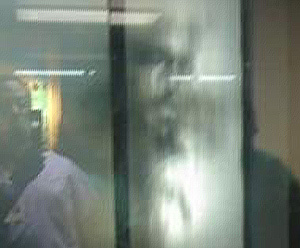 In April 2008 visitors to the Florida Hospital Medical Complex in Orlando, Florida, USA, crowded around a prayer garden window to witness an image of Jesus, which had miraculously appeared there. (see photo)“There was just a whole bunch of people putting their cell phones to the window, so I went over there and I saw a glow,” said hospital visitor Joel Cruzada. “When you are standing there and there is a flurry of people talking about it, you are like: ‘Wow, I’m actually here!’” The unexplained image is now being investigated but a hospital official said that as long as it made people feel good, that was all that mattered. Cordoba – On 14 January 2008, between 9 and 10pm res_idents of Bengolea, Adelia María, Río Cuarto and Coronel Baigorria, among many other towns, reported to Radio LV16 to have seen a round, bright yellow light, flying at low altitude, reported the newspaper La Voz del Interior. Carlos Oyola, a spokesman from the civil and military air facility Área Material Río Cuarto, said: “We do not have any record of a night flight for official or private aircrafts that night. What the controller saw, who is an experienced operator, did not match any known object – military or civil.” He said that the air force controller complied with all the protocols, asking the object to identify itself, in aeronautic code, but did not receive any answer. Río Cuarto – On 29 December 2007 a similar sighting occurred. Residents of Río Cuarto took photographs of a very bright light from 4am till sunrise at 7am. Many saw it come from the east, and remain motionless at low altitude. El Chocon, Neuquen – Jorge Villarreal filmed a UFO in El Chocon on 30 March 2008 while on holiday. He only discovered the unusual sighting back home looking at the videos from his mobile phone. Watching it in slow motion he saw what he thought was a ‘flying saucer’. He took the video to Radio y Televisión de Neuquén (RTN) where technicians, looking at it frame-by-frame, verified that the object was indeed visible. They also concluded that it was almost impossible to tamper with the film on the particular mobile phone Jorge owned. Jorge also remembers that when he was filming the scene, both he and his girlfriend experienced a headache and tiredness. Malargue, Mendoza – On 3 April 2008 Felix Fernandez, Omar Gonzalez and Virgilio Moreno, three workers from the Provincial Road Authority, were returning from La Junta to Malargue. While they were photographing the scenery a strange object caught Felix’s attention when it began “moving in intricate movements”. “I started to take photos of it. It was moving from east to west. Amazed, we followed it from the area of La Junta to the area of El Chacal, always with the sun in the background, as the photos showed. Then it remained motionless for a few seconds and disappeared towards the west”. Some local radio stations confirmed that other people had also witnessed the event. Tupungat, Mendoza – On 6 April 2008, during a trip with friends to Quebrada del Cóndor, Patricio Pereyra took photographs of the scenery with his mobile phone. Later, downloading them onto his computer, he spotted a UFO in the sky: “I took several photos but didn’t see anything in the sky at the time”, he said. Although he is sceptical about the existence of UFOs, he could not explain how it appeared in the photo. When his friend Gastón Damia saw the photo, he thought that Patricio must have put it there with the computer programme Photoshop, but that was not the case. The Association for Thought Field Therapy Foundation is a non-profit membership organization whose volunteers provide psychological help to people traumatized by wars, natural disasters, genocide and poverty. The group’s Trauma Relief Teams, including psychologists, counsellors, doctors, and social workers, are trained in the Callahan Technique of Thought Field Therapy (TFT). They have assisted trauma victims in many parts of the world, including New Orleans and Mississippi in the aftermath of the Hurricane Katrina disaster; Tabasco and Chiapas, Mexico, after major flooding there; and in Kosovo, the Congo, and Rwanda to treat genocide survivors. Caroline Sakai, PhD., a psychologist and TFT practitioner, based in Hawaii, headed a team of therapists who worked with children in an orphanage in Kigali, Rwanda. The children survived the Rwandan genocide in 1994, in which 800,000 to 1 million people were slaughtered during the course of 100 days. 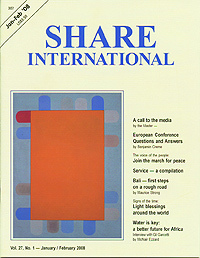 Dr Sakai was interviewed by Michiko Ishikawa for Share International. Share International: How did you come to work with the genocide survivors in Rwanda? Caroline Sakai: The idea came up when I was in New Orleans as part of an ATFT Foundation Trauma Relief Team working with Hurricane Katrina survivors and first responders – doctors, nurses and security people who were working with the survivors. One of the team members, Paul Oas, a psychotherapist and minister, asked me if I could work with the genocide survivors of Rwanda. His church has been helping to support the El Shaddai orphanage in Kigali, Rwanda, by providing necessities like food and shelter. He was seeing the effects of the genocide trauma among the children in terms of Post-Traumatic Stress Disorder (PTSD) – nightmares, flashbacks, insomnia, bedwetting, depression, withdrawal and rage. Reverend Oas wanted to take a TFT team there and work with the genocide survivors. Since I had headed the clinical team in New Orleans, he asked if I could do that in Rwanda. SI: What is unique about your method of working with trauma? CS: Thought Field Therapy is the most rapidly effective, and most gentle, treatment of trauma I have come across. I have worked as a clinical psychologist at Kaiser Hospital in Honolulu, Hawaii, for 31 years, and have used many other, more traditional treatments for PTSD. They usually involve some amount of abreaction (a re-living of the experience) as people work through the trauma, a lot of intensification of the feelings. That may be frightening for some people, who decide they don’t want to continue with the treatment. TFT does not create a lot of abreaction and distress. It is also empowering because it is actually a treatment that people use on themselves. From a feeling of being victimized, they are able to heal and help themselves. When results happen, when there is a lowered automatic emotional reaction, when the flashbacks and nightmares stop, when all the symptoms of PTSD remit, they realize the power that they’ve had to heal themselves. SI: Does Thought Field Therapy work quickly? CS: Yes. In fact we were amazed with the rapidity of treatment in Rwanda. We had only four therapists, and were faced with 400 orphans at El Shaddai orphanage. We found that 174 of them were genocide survivors. With the kind of atrocities they had experienced, we anticipated that it would take at least an hour per child, working individually. We thought we would need three consecutive days, working intensively. It actually turned out that most of them were treated in 15 to 20 minutes. We followed up in the next two days, checking to see if there were any more nightmares, returning flashbacks or other traumas because many of them had experienced multiple traumas during the genocide. SI: What were some of the traumas they experienced? CS: They may have witnessed the murder of their family, and subsequently saw or heard of other murders. Having had first-hand experiences, they re-experienced their own trauma vividly as they heard reports of others. Some of them are among only a few survivors of an entire village. They experienced the loss of many members of their community. The severity of the Rwandan genocide in terms of traumatic impact was so intense because they were not distant killings with rifles or gunshots. The killings were done in close proximity, mainly with machetes. Many victims were neighbors, friends and relatives of those who were the perpetrators. SI: What were the ages of the children at the orphanage? CS: The children ranged in age from 13 to 18, with most of them in their mid-teens. We also treated some adults from the village, whose ages varied. SI: Who runs the orphanage? CS: El Shaddai was created by Sylvestre Nzitukuze, a young teacher and coach. He started bringing homeless street children into his home. They were orphans surviving by doing drugs and prostitution, really victims of genocide, AIDS and poverty. When there were too many children for Sylvestre’s home, he started El Shaddai in an old abandoned warehouse and had the children congregate there. Sylvestre got a church congregation in Rwanda involved and then Reverend Oas’ church in southern California. They work together to help the orphanage with necessary expenses for food and water, salary for the teachers, maintenance of the facility, and so on. SI: What is Thought Field Therapy, the treatment that you used with the children? CS: Thought Field Therapy is a self-treatment that involves the meridians used in acupuncture and acupressure. The treatment includes tapping on the meridian points, eye movement and other activities that activate different parts of the brain. The technique was developed by Dr Roger Callahan, a clinical psychologist in California. He made the discovery in the 1980s and has continued to develop and improve it. SI: How did you begin working with the children at the orphanage? CS: First we did some PTSD assessments. We had the assessment forms translated into Kinyarwanda, which is their language. The teachers, as guardians for the children, did the assessments. The students themselves also did their own subjective assessments. We compared, ranked and ordered them according to their assessments. The most severely traumatized children were seen individually and intensively. Because we were only there for three weeks and had only four therapists, we saw most of the children in small groups and then in larger groups, and saw the rest in class. We went through the treatment protocols with them. There are different treatments for different problems. If they are dealing with PTSD, there is a trauma treatment involving tapping several meridian points. There were also a lot of people dealing with anger or guilt, so we would do those particular protocols which involve different meridian points. The tapping is done firmly but gently, about 5 to 10 taps, depending on the protocol. SI: Did the children do the tapping themselves? CS: We showed them the taps, and our interpreters would show how and where to tap. The children were very quick learners. Let me give you an example. There was a 15-year-old girl who was three years old at the time of the genocide. Her family had taken refuge inside a church when the perpetrators started coming in and killing people. The girl related how her father had told her to run and not look back no matter what happened. She started to run as fast as she could and then heard her father yelling and screaming. He sounded like a crazy man, which was uncharacteristic of him. Even though she remembered that he had said not to look back, because she kept hearing him scream she turned to see why. A group of people with machetes were attacking her father. Every day following the attack 12 years before, the girl had flashbacks of that scene; she called it a day-mare. She would have this day-mare of seeing her father being killed, and would have nightmares about it every night. As we were working it through and she was tapping the different meridians, she suddenly stopped and started to smile. She said she could remember her father playing with her, and that she had had no childhood memories before. The genocide was so much in the forefront of her memory that it blocked out everything else. Then I asked her what she was feeling when she thought again about what had happened in the church. The interpreter, who was a pastor, looked at me hesitantly, as if to ask: “Why are you are bringing it back up again when she was doing fine?” But we need a complete treatment. The girl started crying and remembered seeing other people being killed. She recalled how she and another child who survived had escaped, and realized that her father had saved their lives by what he had done to distract the perpetrators’ attention. She was crying as she remembered different scenes. We continued to work through each of the traumatic events, and after about 15 or 20 minutes, she started laughing. We asked her what was coming up for her now, and she talked about her father. Her mother didn’t want them eating very sweet fruits because they were not good for the children’s teeth. But her father would sneak them home in his pockets and when her mother wasn’t looking he would give them to the children. She was laughing wholeheartedly, and we laughed with her. Then I asked, now when you think about what happened in the church, what comes up? She paused and said without tears: “I can still remember it, but now it seems like a distant memory, like 12 years ago.” She started to talk about other fond memories. Shortly thereafter, we ended her session for that day and made arrangements to see her the next day. She came in the next day looking much more cheerful. She told us that for the first time she had no nightmares and was able to sleep well. She started recounting many more happy memories. SI: That story still moves you when you talk about it. CS: Yes, it was very moving. We were very moved by the people in Rwanda and their wanting to be able to give back and show appreciation. They had a tremendous resilience, a tremendous capacity for forgiveness, an ability to experience and express their joy and appreciation of life. One example was an elderly gentleman from the village. He was watching us work and asked if we could also work on him. He had been made to watch the slaughter of his wife and children and other villagers. Then the perpetrators started hitting him with machetes. Twelve years later we could still see the huge wounds on his neck and head. It was a miracle that he managed to survive. The wounds were healed but there were huge scars. He said he had constant flashbacks and nightmares. We worked with him using TFT. The next day he came back and said he slept well for the first time in 12 years with no nightmares. He asked if we could help him with his dizziness, which caused him to fall frequently. We thought that he might need some medical or neurological help, but obviously the villagers don’t have much access to, nor the money to pay for, medical services. So we thought we would try the diagnostic level of TFT, which provides an individualized treatment. Most of the treatments we provided in Rwanda were the standard practices found in Roger Callahan’s book, Tapping the Healer Within. We present a selection of quotations on the theme of ‘Health and healing’ from Maitreya (Messages from Maitreya the Christ, and Maitreya’s Teachings – The Laws of Life), Benjamin Creme’s Master (A Master Speaks), and Benjamin Creme’s writings. Market forces have created social and natural havoc. People have been condemned to death, literally, in the name of profit and loss. Hospitals have been shut because they are not profitable, schools have difficulty in staying open. These institutions are essential for the health and well-being of society. Spiritually and mentally, many people are bankrupt. They know only how to get up in the morning and go to work. They come home and go to bed. They have been conditioned by politics and religion and condemned to spiritual and mental imprisonment. Everything around us has been created by nature, but disasters, destruction, depression and disease are man-made. The people you must demand an answer from are your leaders, those who have conditioned you and prevented you from enjoying a life of bliss and peace. One of the outstanding happenings of the present time has been the rise into prominence of so-called spiritual or faith healers of various kinds. There has been a marked shift in public acceptance of their role and gifts and this on a worldwide scale. A new interest in the ancient healing methods of the East has widened the technical resources and understanding of Western practitioners, while prevention of disease – the creation of conditions of health and vitality – is gradually gaining a major role. All of this portends well for the future, a future in which we shall see the gradual conquering of the ills which so beset mankind. The first step will be to eradicate the fear of disease and, from an understanding of its cause, inculcate a more correct approach to its control. The transformation of social structures will do much to improve the health of humanity, removing much of the chronic stress and anxiety which is the experience of millions today. Greater leisure and recreation will play their part while sounder agricultural methods will ensure the production of food whose vitality is adequate to man’s needs. When mankind realizes the true nature of its constitution – as a soul reflecting itself through mental, emotional and twofold physical (etheric and dense) bodies, the first step in the conquering of disease will be taken. Until now, man’s attention has been focused on the dense-physical plane while the causes of disease are to be found in the misappropriation of the energies flowing through the subtler bodies. Experience the Self within – If you follow others instead of being yourself, you lose your sparkle; you cannot reflect the light of individuality. Without that light, there is no progress in life. Similarly, when you experience the Self within and come to know you are an immortal entity, completely separate from mind, spirit and body, you learn to use these temples of the Lord creatively, with awareness. Processes of healing follow automatically. This is why Maitreya has said that even people with AIDS will be healed through prayer and through the practice of honesty of mind, sincerity of spirit and detachment. The etheric planes of matter await man’s exploration and study. Therein will be found the origin of that disequilibrium of forces which manifests itself as the body’s ills. The treatment of disease will take on a new dimension when the function of the force centres (chakras) as receivers and dispensers of energy is understood and when their connection with the major glands of the endocrine system is known. Already, of course, there are those few practitioners who know this and who do valuable work, but not until this knowledge is general shall we see much advance in the understanding of the mechanism of disease. In the etheric body – the body of finer-than-solid but still physical matter – there is a group of chakras or energy centres, including seven major ones in the spine, through which our energies flow. The energy that we receive comes from cosmos, the solar system, our own planet and our soul, entering the system we call ‘ourselves’. If the chakras are working in a balanced way we get equilibrium in the energetic system. If from wrong use of soul energy (the major factor in dis-ease) we have produced a stasis, or dislocation of the flow, some of the chakras will not be functioning as they should. This results in an imbalance in the energy streaming through the body. Related to the chakras is our endocrine system, the glands in the physical body. The health of the glands depends entirely on the correct flow of energy in the etheric body through the chakras, while the health of the physical body depends on the correct functioning relationship between the glands. We are souls in incarnation. The energy which galvanizes our life is coming from the soul. As we evolve we can come more and more into touch with the soul, but if we do not use the energy in the correct way we produce dis-ease, disequilibrium. Healing brings to bear a degree of higher or stronger energy, to create a balance. That might be total and permanent, or in many cases temporary. If you would maintain the health of the body, you must maintain the correct balance of the endocrine system which needs the correct, uninhibited flow of energy in and out of the chakras, in a balanced, co-ordinated way. Because of our wrong living conditions, of our badly-constructed and maintained environment, and because of all sorts of inhibiting factors in our education, our upbringing and so on, no one lives in a perfect state of total equilibrium. No one has perfect health. Everyone is inhibited because of the social norms within which we live, especially in our cities. Each of us suffers from the results of inhibition of one kind or another. We repeat this on the emotional and on the mental level. The inhibitions on the mental level are very severe indeed; they lead us to become fundamentalist Christian, fundamentalist Jew, Muslim, Hindu, Buddhist, etc. These are mental straightjackets. They inhibit the free, thinking process of the mind. We cannot think creatively because it has all been thought for us. We are given a set of ideas, of beliefs, to believe in. May Day, or Labour Day, has traditionally belonged to the workers but on 1 May 2008 they were joined by thousands of people affected by poverty, rallying across the world. Issues and demands included workers’ and immigrants’ rights; food costs, living standards and pension reforms; and the Iraq war. In France around 120,000 people marched in cities across the country, demanding higher wages and pensions, and calling on President Sarkozy to deal with rising living costs. In Paris two major trade unions held a large joint rally for the first time in four years. In Marseilles, unions claimed that 30,000 took to the streets. Many of the marchers were immigrants, calling for the legalization of undocumented workers. “There are no foreigners in this land. Liberty, Equality, Fraternity. Justice!! !” said one banner. In Germany protesters called for the introduction of a national minimum wage and drew attention to the growing divide between rich and poor. In Serbia, around 10,000 people protested against privatization and called for better living standards. In Greece transport and public services were brought to a standstill by a 24-hour May Day strike against the government’s privatization and pension reforms. Marches took place in Athens and other major cities. Thousands marched in Istanbul, Turkey, in a demonstration which turned violent when protesters tried to defy a government ban on May Day rallies being held in the central square. One of the grievances was government plans to raise the retirement age and cut social security provision. Around 70,000 workers marched in Mexico demanding that the government end food shortages and unemployment. In Ecuador over 15,000 protested against subcontracting and labour conditions. There were also large demonstrations in, among other Latin American countries, Guatemala, Nicaragua and Chile with thousands taking part. In Bolivia, President Evo Morales attended a May Day event in La Paz and called on the US to withdraw troops from Iraq and in Paraguay the President-elect Fernando Lugo was the first incoming president to be invited to attend May Day rallies. In Venezuela marches were held both in favour of and against the government of President Hugo Chavez. In Indonesia thousands of people marched from central Jakarta to the presidential palace, protesting against the outsourcing of work, and high food prices. Indonesian domestic workers took part in a march through the streets of Hong Kong, joined by workers from the territory and other overseas workers to demand higher wages as the city battles against a weak currency and high inflation. A May Day rally in Tokyo, Japan, attracted around 44,000 people, with concern over fuel prices a major issue. The price of food and low wages were again the concern of those in Lebanon, where around 10,000 marched through the centre of Beirut. A crowd estimated by the organizers to be 15,000-strong marched in London to a rally in Trafalgar Square on 10 May 2008 calling for the end of the Israeli occupation of Palestinian land and the lifting of the siege of Gaza. The rally was organized by the British Muslim Initiative, Palestine Solidarity Campaign, Palestinian Forum in Britain and supported by many Trade Unions. Many protestors wore black to commemorate Nakba, the 60th anniversary of the founding of Israel. Trafalgar Square soon filled up with waves of chanting marchers and a forest of placards and flags. Speaker after speaker described the dire condition of life in Gaza: untreated sewage from failing sewage treatment works, barely functioning hospitals the lack of safe clean drinking water, fuel, food or medical aid. They condemned checkpoints in the West Bank, the separatist wall, the policy of apartheid and collective punishment and called on supporters to boycott Israeli goods. British Politicians Tony Benn and George Galloway were among the speakers.